February 2015 - ID Studios, Inc.
San Diego-based design firm ID Studios, Inc. today announced the opening of Lytx’s new corporate headquarters, which was custom-designed by ID Studios to bring the building to life and create a new home for the technology company that has rapidly outgrown its previous location. The new campus includes 40 collaboration rooms, over 270 workspaces, training rooms, a café with adjoining outdoor space, and a demonstration room to preview Lytx’s video-based driver safety technology. 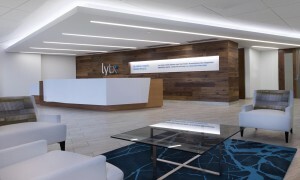 The entire campus was designed to reflect Lytx’s core values of experience, trust, humility, and teamwork – emphasized by the wood-paneled walls in the lobby that inspire a sense warmth and stability and dynamic angled lines in the flooring and ceiling to represent Lytx’s forward-thinking approach. Technology built into the meeting spaces facilitate easy collaboration for their internal meetings, as well as video conferencing with global colleagues, from advanced audio-visual connections in most conference rooms, coupled with writeable wall surfaces in collaborative areas and office spaces, to wireless access outside to extend the workspace. ID Studios specializes in workplace design and believes that forward-thinking design strategies have the power to transform the way in which people work, learn and communicate with one another. At the heart of ID Studios’ services is a passion for crafting creative solutions that respond to clients’ individualized needs and visions. Workplace collaboration and discovery happens everywhere, which is why ID Studios weaves innovations in design and technology into the complex and unique fabric of each of its clients’ projects.